Anna senior Lexi Wells sets up for a teammate during a match against Jackson Center in Anna on August 31, 2017. Wells had 828 assists and 210 digs as a junior last season for the Rockets, which won the SCAL with a 10-2 record. 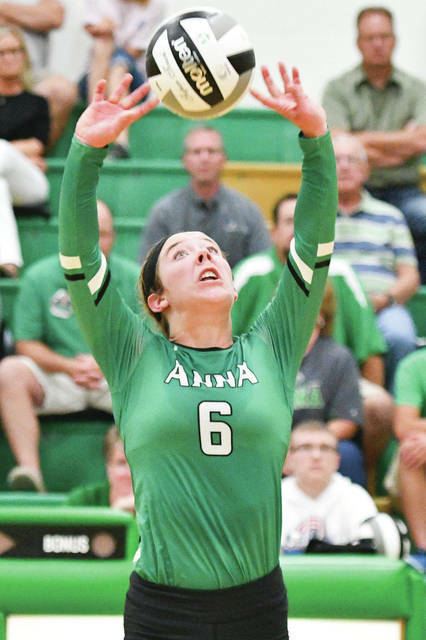 ANNA — Like every volleyball team this time of the year, the Anna Rockets recently set their goals for the season. And the Rockets’ biggest goal is every team’s dream. Anna reached the Division III regional semifinals last season before falling to Miami East. The Rockets, with five starters back, are shooting for state this season. One advantage the Rockets have is a coach who knows what it takes to get there. Zumberger was a junior on Anna’s 2006 state championship team. The Rockets also reached state in 2005 and 1987. “That would be such a great experience to have and something we could all share together,” said Zumberger, who enters her seventh season with the Rockets. Five seniors return for the Rockets, led by Emma Meyer. Meyer led the team in kills (329), blocks (152) and was sixth in digs (103). Senior setter Lexi Wells returns with her 828 assists. She also led Anna in aces (31), was second in blocks (72) and fourth in digs (210). Senior libero Abby Counts was third in digs (259), while senior Sierra Williams (39 digs and 39 blocks) and senior Lindsey Barhorst (second in digs with 208) also contributed to the regional run. Also back are junior Macy Wiktorowski (second with digs 249, third with 46 blocks) and junior Madison Roe (fourth in kills with 71). Lauren Barhorst missed last season with an injury and adds depth and height at 6-foot-1. Anna won the Shelby County Athletic League going 19-8 overall and 10-2 in the league. Repeating is one of the Rockets’ goals. As is that hopeful run to state. Anna reached the D-III regional semifinals before falling to Miami East in straight sets. Anna gets an early test when it opens with Versailles, the defending D-III state champions. Versailles knocked out Miami East in five sets and two matches later won state in a five-set thriller against Coldwater. “Not that we can ever ease into our season but we’re starting off strong with Versailles. I think it’ll give us a gauge to see where we are. Every night is going to be a battle,” Zumberger said. Four of the SCAL’s seven teams reached the regional tournament last season. Joining Anna were Fort Loramie, Russia and Jackson Center in D-IV. “Definitely playing in our conference helps us with our tournament run,” Zumberger said. “When we go to our tournament draw we might have a decent record, but people don’t know the conference we come from is very strong. Won the Western Ohio Soccer League title. The Rockets’ list of accolades included eight additions to the OHSAA girls soccer record books in a variety of categories. Anna (18-1) returns four seniors and 10 juniors from a team that won its first 18 games before falling to Lehman Catholic in the Division III district final. The schedule is again tough with new additions including Northmont, Chaminade Julienne and Miami Valley. Defender Claire Bensman, defender Brooke Hemsworth, midfielder Kelsie McKinney and wing Marissa VanGorden return to provide senior leadership for the Rockets. The roster is also loaded with 10 juniors, Noll’s first class after taking over the program for the 2016 season. Among the returning juniors are keeper Savanna Hostetler and forward Taylor Noll. Both earned mentions in the OHSAA record books with Hostetler’s 13 consecutive shutouts (No. 2 all-time) and 15 shutouts overall (11th). Noll’s 41 goals ranked 27th all-time and her five assists in one game ranked sixth. Hostetler’s season came to a sudden end in the sectional final. Hostetler dove to secure a ball and received a kick to the head from an opponent trying to leap over her. She sat out the 4-0 district final loss to Lehman played three days later. The Rockets beat the Cavaliers 2-1 during the regular season to secure the WOSL title with an 8-0 record. The majority of Noll’s juniors have been with him since he started coaching their sixth-grade traveling team. He enters his third season at Anna 31-4-2. There are 29 players on the roster and the program has a junior varsity team for the second straight season. Anna and Lehman are again considered the frontrunners for the WOSL title. Lehman had won every title since the league started in 2014 and had never lost a WOSL game until Anna ended both of those streaks. The Rockets anticipate a similar — if not better — run this season even if Noll didn’t know exactly what he was getting himself into when taking over that traveling team his daughter played on. Anna finished fifth in the SCAL race last year, but coach Dean Stewart says a strong group of freshmen should help lead an improved squad this year. Anna’s incoming freshmen helped the junior high squad finish second in last year’s SCAL middle school race. The junior high team won three invitational last year and was runner-up in four others. Stewart, who is entering his 33rd season as the program’s coach, said freshman Hope Bixler, Kaylie Brewer, Kaylie Kipp and Breann Reaman should make an immediate impact. The squad’s top two returnees are sophomore Addison Brewer and senior Ashleigh Jurosic. Brewer’s fastest time last year was 23:26, while Jurosic’s was 23:50. “Like any young team, there will be a growing curve, and we will look for a steady improvement throughout the upcoming season,” Stewart said. Stewart said Fort Loramie is the heavy favorite to win the SCAL this season. He also expects Russia to be good. Anna returns all but one of its top seven runners from last year, and Dean is expecting the squad to be much improved after finishing last in the SCAL meet last year. Sophomore Jacob Robinson is the team’s top returning runner from last year. Robinson finished seventh in the SCAL race last year with a time of 17:36, his best finish all season. Five other letterwinners return in junior Caleb Gaier and seniors Derek Arling, Jacob Osborne, Cameron Bowersock and Preston Shannon. Senior Colton Nanik joins the squad this year with freshmen Lucas Smith, Collin Frilling and Hayden Schmidt. Stewart said the three freshmen were among the best in the state in junior high last year. “Lucas Smith was junior high SCAL champ in cross country and the 1,600 and 800 races in track,” Stewart said. “Collin Frilling was fourth in cross country, second behind Lucas in the 1,600 and third in the 800. Stewart expects Fort Loramie to win the league this year and for both the Redskins and Houston to qualify for the state meet. He also said Botkins should be strong. Anna will be young after losing its three top golfers from last season’s squad, which finished second in SCAL play with a 10-2 record. Among the three who graduated is Mason Platfoot, who was runner-up SCAL player of the year to Nick Fischio and is now playing at the University of Northwestern Ohio. The team’s two returning letterwinners are juniors Cole Maurer and Bryce Havenar. Cobb said the team’s key newcomers are sophomores Spencer McClay and Levi Cain and freshmen Bryce Cobb and Carter Gordon. Cobb, who is entering his fourth season as the program’s coach, expects an open race in the SCAL. After playing a partial schedule last year, Anna’s girls golf squad is up and running for its first season. The team is made of seniors Olivia Pulfer, Breah Kuck and Elaina Crosson and juniors Maura Rose, Abbie McEldowney, Lindsey McEldwoney, Riley Thobe and Morgan Meyer. Tony Metzler will coach the program after spending the last two years as Graham’s coach. Sidney Daily News sports editor Bryant Billing contributed to this article. This entry was tagged 2018, Abbie McEldowney, Abby Counts, Addison Brewer, Anna, Ashleigh Jurosic, boys cross country, boys golf, Brandon Cobb, Breah Kuck, Breann Reaman, Brooke Hemsworth, Bryce Cobb, Bryce Havenar, Caleb Gaier, Cameron Bowersock, Carter Gordon, Claire Bensman, Cole Maurrer, Collin Frilling, Colton Nanik, cross country, Dean Stewart, Derek Arling, Elaina Crosson, Emma Meyer, fall sports, girls cross country, girls golf, girls soccer, golf, Hayden Schmidt, high school, high school fall preview 2018, Hope Bixler, Jacob ORbinson, Jacob Osborne, Kaylie Brewer, Kaylie Kipp, Kelisie McKinney, Kelli Zumberger, Lauren Barhorst, Levi Cain, Lexi Wells, Lindsey Barhorst, Lindsey McEldowney, Lucas Smith, Macy Wiktorowski, Madison Roe, Marissa VanGorden, Mason Platfoot, Maura Rose, Morgan Meyer, Olivia Pulfer, prep, Preston Shannon, preview, Riley Thobe, Rockets, Savanna Hostetler, Sierra Williams, soccer, Spencer McClay, Taylor Noll, Tony Metzler, Volleyball. Bookmark the permalink.